So wrote Darwin in his journal, describing his worldwide journey on board HMS Beagle on its expedition survey. The archipelago Darwin refers to is, of course, the Galapagos Islands, and the birds are the different species of finches he observed. Modern research demonstrated that Darwin was correct: A small group of finches of the same species, which arrived at the Galapagos 2-3 million years ago, are the ancestors of all finch species currently inhabiting the islands. Over time, they diverged into different species that reside in different ecological niches. Some species spend most of their time on the ground, others on trees; some eat seeds or fruit, while others prefer insects, snails, flower nectar, or, in one case – the blood of sea birds. The body sizes, especially their beaks, have adapted throughout evolution to the ecological niche each species inhabited: The strong beak needed to break seed shells, a long and thin beak for finding insects within tree trunks, or one that is sharp enough to break birds’ skin. But what would happen if all finch species were to abandon their traditional food sources and start eating the same food? This type of scenario has already been observed in the more populated areas of the islands, where finches often encounter easily available food: Leftovers from humans’ meals. In a recent paper, researchers warned that the transition to eating leftovers may interfere with the finches' evolution, the inter-species differences, and even their chances of survival. The medium ground finch, Geospiza fortis, inhabits the island of Santa Cruz. As its name indicates, this species is the "Goldilocks" of ground finches: The island is also home to a larger finch with a larger beak, which eats large seeds, and a smaller finch with a small beak that eats small seeds. The medium finch, as its name suggests, likes its seeds "not too small and not too large." Yet as this not-too-big-and-not-too-small range is rather wide, over time, researchers began observing two distinct populations of the medium ground finch: Those feeding on small-medium sized seeds and those that eat medium-large seeds. The former have smaller and weaker beaks and the latter – large beaks and a strong bite. The divergence of a species to two populations, which consume slightly different foods and tend to reproduce each within itself, can eventually lead to the formation of two separate species, or speciation. This pattern, however, is not seen everywhere on the island. In observations made elsewhere on the island, the researchers did not witness a separation of populations according to beak size – despite reports from the 1960s indicating the existence of distinct populations. Why does it occur in one location but not in the other? The most prominent difference between the two locations is their proximity to human settlement: While the second one is closer, the first, where separate populations were observed, is more distant. The researchers hypothesize that the presence of humans, or, to be exact – of their leftover food – interferes with the separation process: Instead of eating different types of seeds, they all eat junk food. Even the current separation between species is not definite. In evolutionary terms, the finch species are relatively new, and many of them can still reproduce with one another to produce fertile offspring. If the ecological differences that set them apart, such as different food sources, disappear, they may interbreed and lose their unique identities. In the most recent study, the researchers asked if such a process is already taking place. They left trays piled with local seeds or human foods at a number of locations inhabited by ground finches on Santa Cruz, some near human settlements and some far from it. The first thing they observed was that the more inhabited region had more finches, and many of them were not afraid to approach humans. 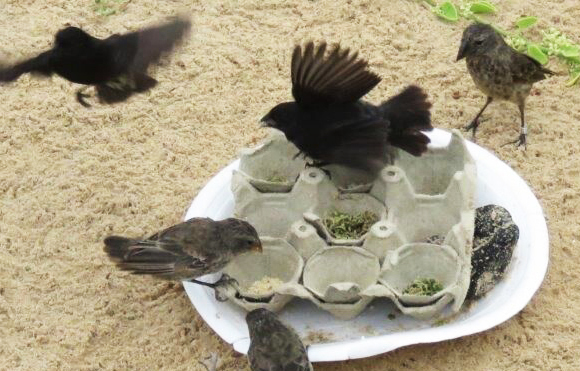 These finches completely disregarded the tray with the seeds and preferred human foods – rice, potato chips, and coconut cookies. In a location defined as "intermediate urban," a smaller number of finches came near the tray, and those that did, ate mainly the rice. The more isolated location had fewer finches in general, and they were afraid of humans. Only one of them approached the tray, but did not eat anything. On the fourth and final location, an uninhabited beach that is a tourist attraction, the finches behaved just like the ones in the "urban" location: Ate a lot, preferring the human foods. What does this signify in terms of the evolution of these finches? 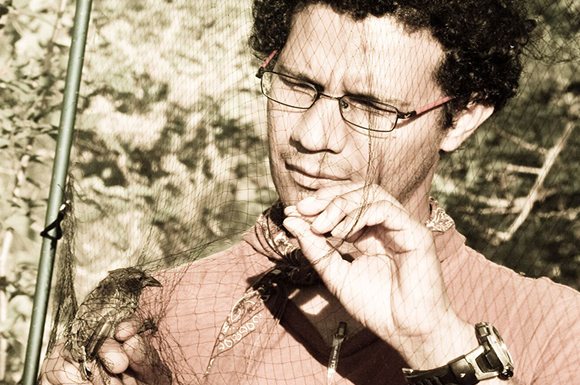 "We know one way finches diversify and become new species is by specializing in different food types", said Luis De León, who led the study. At the present time, however, "all three or four species of ground finches at urban sites on Santa Cruz Island seem to be converging onto the same junk food diet. If that's the case, the selection pressures that would be naturally keeping them apart would be weakening, possibly leading to the collapse of the adaptive radiation of ground finches." But why should we care about having more or fewer finch species? One reason is the wish to preserve natural genetic diversity. The type of hybridization observed in this study would eventually lead to an increasing similarity among finch species and the loss of their unique properties. "When thinking about preserving biodiversity in general, we often focus on preserving individual species," said De León. "What we show with this work is we also need to consider preserving the processes that lead to the formation of species". Another reason is that, in the long run, adaptation to a junk-food diet may harm the finches. The researchers hypothesized that over time, the finches may develop an "urban beak" – a smaller, softer beak, suited to eating potato chips and cookie crumbs. Such a beak would not enable the finches to crack hard seeds, and in case they immigrate to more isolated regions, they will have difficulty finding food. Even worse: If the local finches reproduce, they may pass on their inefficient beaks to their offspring, exposing a large portion of the population to starvation risk in case of a food shortage, like during a drought. One of the study’s most disturbing findings was that humans exert this effect on the finches even without expanding their towns: On the beach, a touristic, non-urban region, the finches behaved just like the urban finches. The presence of humans themselves – and not buildings – was what mattered. When we talk about the ecological effect of human settlement, we usually think about the destruction of habitats or pollution, which are short-term effects. But urbanization may have substantial and completely unexpected long-term effects. Only in recent years are we beginning to see how the city, and in this case, the mere presence of humans, impacts the evolution of animals around us. Less than 200 years after Darwin visited the Galapagos Islands and observed the finches and their unique adaptations, we may be on the path to losing them. If we do not act now to revert the situation, we will find ourselves, as De León put it, "getting in the way of evolution."